02300 - Metal sign, 5" tall x 24" long. 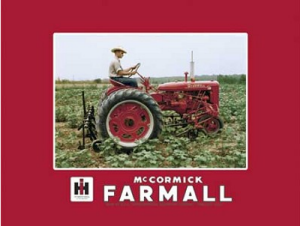 "FARMALL COUNTRY" in raised red letters (w/ black outline) on a gray/silver background. Farmall 400 tractor pictured on left-hand end. 02302 --- Metal license plate, 6" tall x 11-7/8" long. Raised red & black images of Farmall 400 tractor, IH emblem, and words "FARMALL COLLECTOR" on a raised, silver, "diamond-plate" background. Part 08005 - FARMALL IN FIELD, heavy fleece blanket, 47" x 60"
08005 --- Heavy fleece blanket, 47 inches x 60 inches, featuring a classic Farmall tractor farm scene (Tractor with driver in field.). Machine washable, 100% polyester.